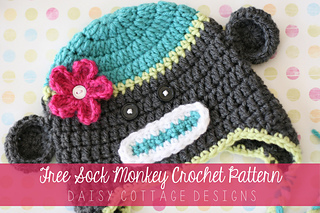 This is a crochet pattern for this adorable monkey hat! Detailed instructions are included.This hat is fantastic for photo shoots, baby gifts, or every day wear. Imagine the oohs and ahhs you’d get if this hat was pulled out of a bag at a birthday party! People would be even more pleased to know that you’d made it yourself! All sizes of this hat are available in my Etsy shop, but the 1-3 year size is available for free on my blog.